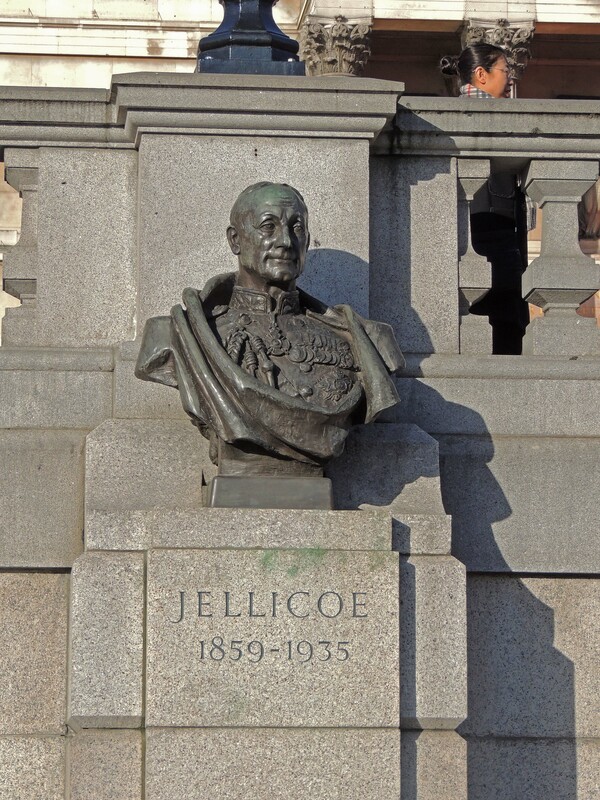 Bust of Earl Jellicoe in Trafalgar Sq. John Jellicoe was born in December 1859. His father was a merchant sea captain and John entered the navy as a cadet at the age of 13. He was promoted to lieutenant in 1880 and saw action in the Anglo-Egyptian war. In 1884 he attended gunnery school where he qualified as a gunnery officer. Two years later he was awarded the board of trade silver medal for his part in the rescue of the crew of a capsized merchant boat off Gibraltar. He was promoted to Commander in 1891 and served on the flagship of the Mediterranean fleet for 6 years before being promoted to captain and being appointed as a member of the Admiralty Ordinance Committee. He commanded the battleship HMS Centurion and saw action in the far east during the Boxer Rebellion in China. He was badly wounded at the battle of Beicong and doctors believed he would die of his wounds, but he survived and returned to the UK where he was appointed as Asst. to the Controller of the Navy in August 1901 and after 4 years he was made Director of Naval Ordinance. The following year, 1906, he was appointed ADC to King Edward VII. He was made Rear-Admiral in February 1907 and worked to encourage the Royal Navy that it needed to modernise it’s fleet with the addition of new warships. Later that same year he was appointed second in command of the Atlantic fleet. He served in this role for a year before returning to the Admiralty as controller of the Navy. In late 1910 he returned to the Atlantic fleet this time as its commander. In December of 1911, having been promoted to Vice-Admiral a few months earlier, he was appointed as second in command of the Home fleet. At the outbreak of the first world war he was promoted to full Admiral and given command of the Grand fleet which he commanded at the Battle of Jutland, the largest battle of heavy warships in history, in May 1915. 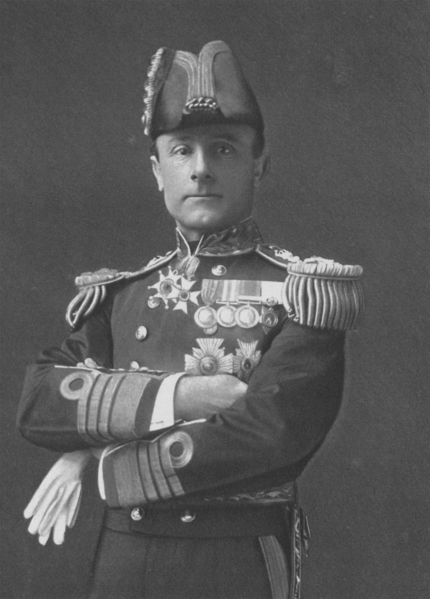 In November of 1916 he was appointed First Sea Lord (Head of Admiralty and Navy). In this position, he was responsible for directing British Naval actions throughout the remainder of the war. He was created Viscount Jellicoe in March 1918. At the conclusion of the war he was promoted to Admiral of the Fleet and retired from active service. In September of 1920 he became Governor-General of New Zealand, a post he held for 4 years. On his return to the UK, he was created Earl Jellicoe in July 1925. He died following an illness at his home on 20 November 1935 and was buried in St Paul’s Cathedral.